Europe is one of the most expensive areas to travel to and even here there are some cities that are a little more costly than others. Copenhagen has a reputation for being pricey and it's quite true although there are some absolutely delicious bargains to be found! Danes use the Krone over the Euro (the latter can be used but it works out to be more expensive than using krone) and it can be higher if the exchange rate isn't in your favour. 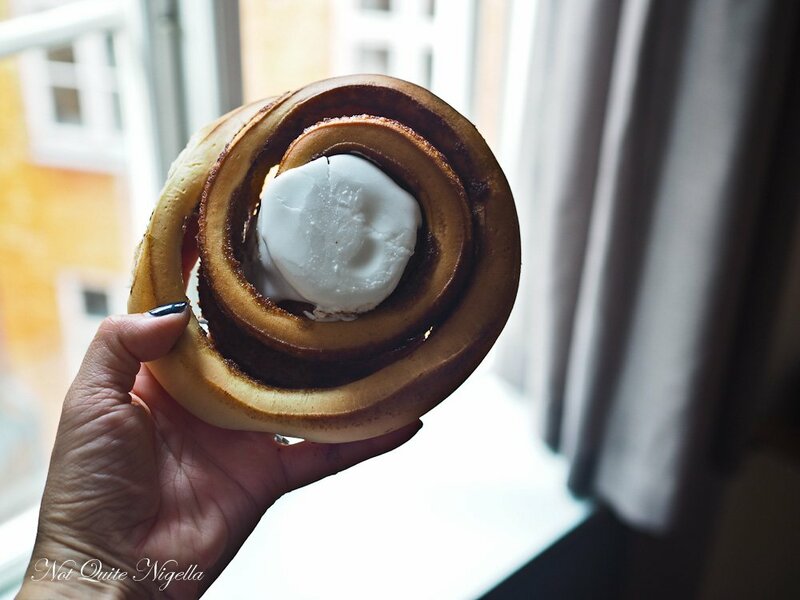 But don't let that stop you from eating out in this gastronomic paradise and let me present you with these nine amazingly delicious cheap eats in Copenhagen! If you're lucky enough to be in Copenhagen on a Wednesday and you happen to be near the Latin Quarter pop into Sankt Peders Strade Bageri (said to be the oldest bakery in Copenhagen open in 1652). They are famous for their "Onsdagssneglen" or Wednesday cinnamon buns. Available as the name suggests only on a Wednesday large specimens much larger than the size of a regular cinnamon bun but retail at just 15KR (or around $3AUD). They are best in the morning when they are warm (during the day they cool off and find it puzzling if you ask for them to be heated). They sell 4,000 of them a day with the scrolls available usually until the day's end. 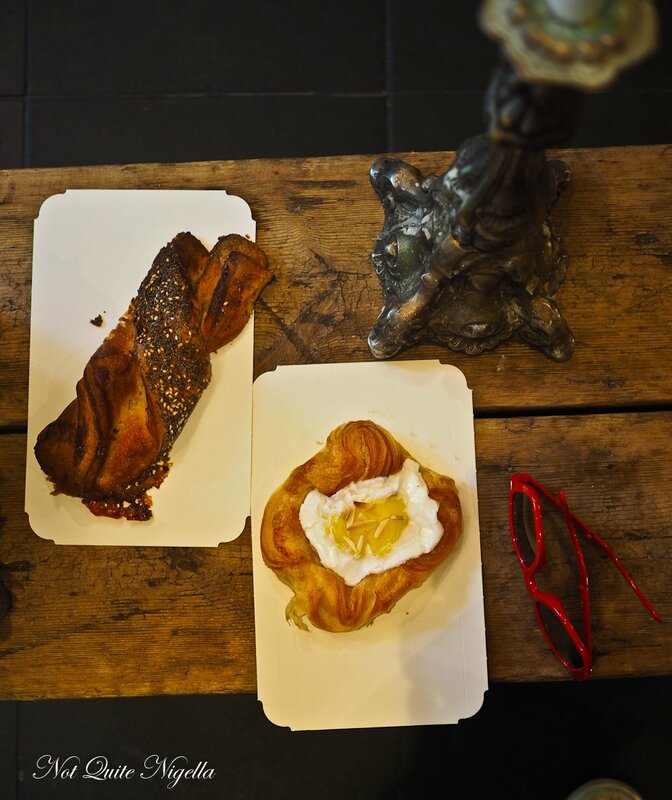 Ask a Dane about where to get a Danish pastry and you may just get a puzzled look in response but ask them about a onsdagssnegle, frøsnapper or spandauer and you'll get pointed in the direction of a bageri or bakery. At Sankt Peders Strade Bageri each buttery pastry will set you back between 10-15KR, a great price for a freshly baked indulgence. Spandauers are a buttery laminated pastry with a centre of soft white icing-kind of like a cross between a croissant and a cinnamon bun. The frøsnapper or a seed snapper gets its name from the sesame and poppyseeds that feature on this twisted, laminated buttery pastry that also features a sprinkling of sugar. It's thin buttery and crunchy and for those that love something a bit different. 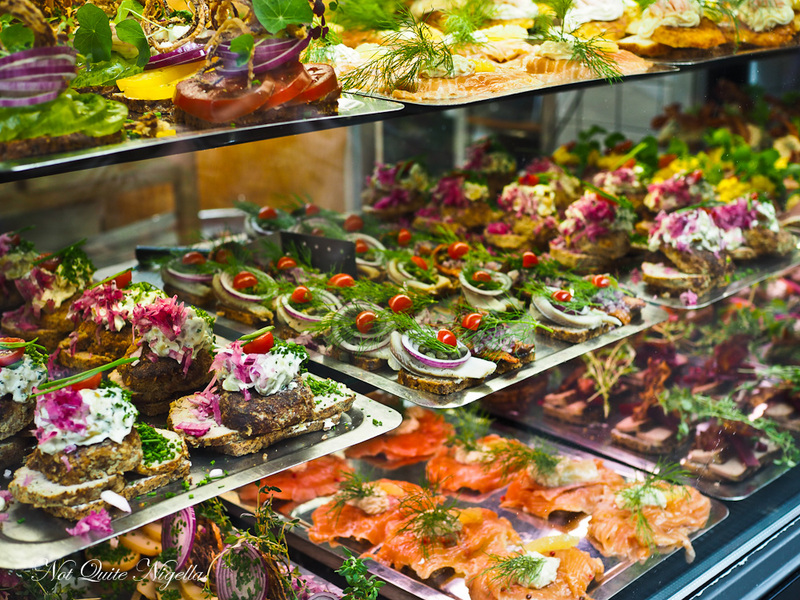 Smørrebrød is a delight for those who often find sandwiches too bready. These Danish open sandwiches are served on a piece of rye bread which is dark, dense and lightly toasted. The most traditional topping is herring which can be marinated, fried or in a curry. At Restaurant Schønnemann at Hauser Plads (look for the white interactive display park outside) it's usually an expensive affair but for lunch you can have your choice of the three most traditional Danish Smørrebrød for just 198Kr or around $40AUD, an absolute bargain as far as a Michelin (2015) lunch goes. It's not enormous but it's plenty enough for lunch. The herring should always be eaten first and is served with onions, capers and a curry mayonnaise. The fried plaice fillet is garnished with Greenland shrimps, lemon and mayonnaise and is crunchy delicious. Drinks do add on a lot to the bill so be aware of this. Before I visited his native Copenhagen, my friend Viggo said that whatever I needed to do, I had to have a Danish hot dog. Now in Australia they can be quite simple affairs but in Denmark hot dog stands serve sausages topped with onions, pickled and fried onions. At DOP they take it a step further and serve up organic hot dogs. These come in a variety of sausage types-the most popular is the regular roasted pork but there is also goat, chicken, spicy beef, vegetarian, cheese and pork with wild garlic. The hot dog bun isn't a soft white bun, instead it's a whole wheat bun topped with linseed. There is a choice of toppings too - from mashed potato to stewed kale. 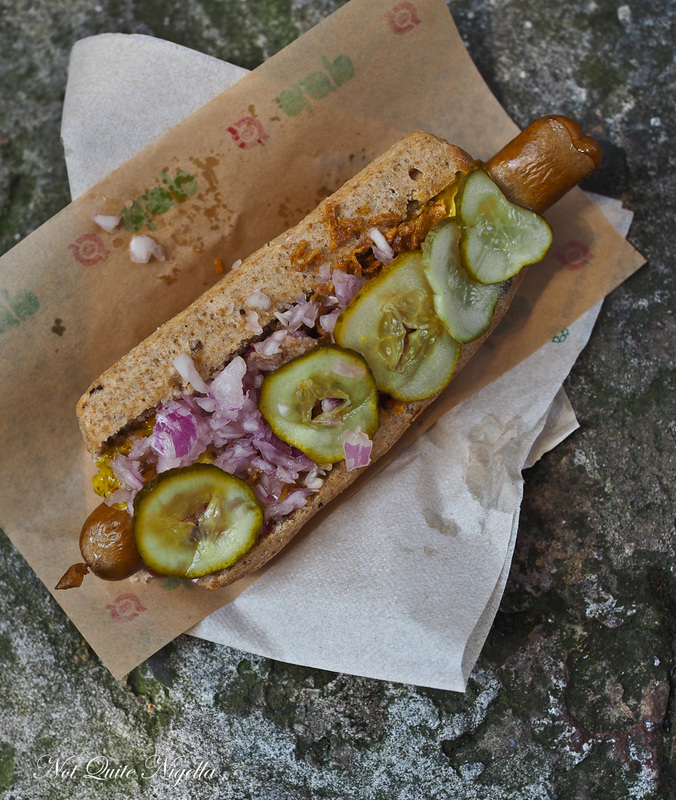 I try the most popular one: a roasted sausage with mustard, ketchup, remooulade, fried onions, fresh onions and pickles. All for around 35KR or around $7AUD. 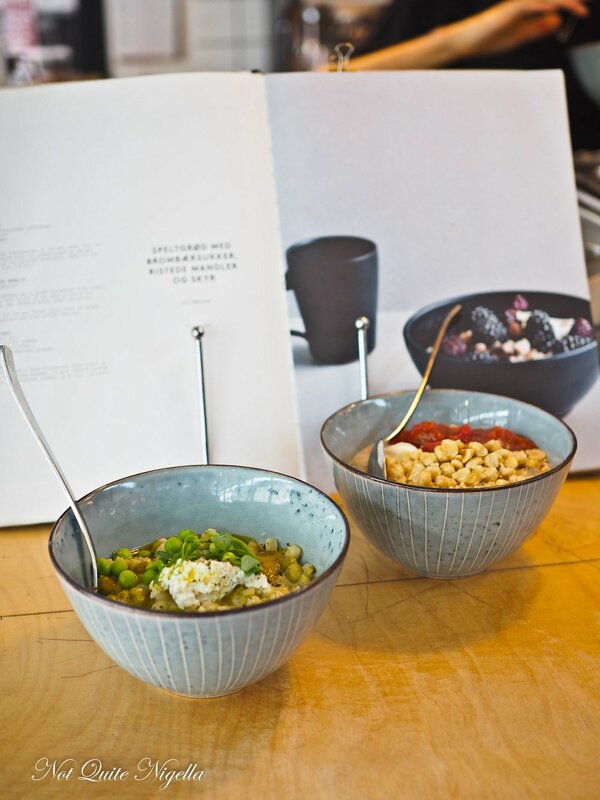 Porridge is somewhat of a national obsession in Denmark and the Grøed (gruel in Danish) shops feature porridge in sweet and savoury forms. The best selling sweet porridge is a salted caramel and apple oatmeal porridge but there are gruels from all over the world using other grains from Indian dahl, Chinese congee to Italian risotto (the latter being the best selling savoury porridge). We decide to go for something with more of a Scandinavian bent to it. A rhubarb and hazelnut porridge made with barley spelt porridge is rich in vanilla and almond milk and has a lovely comforting texture. But it's the savoury one made with barley and fresh and cooked peas, tendrils of snow peas, risotto and olive oil that feels like you're doing your body good. There are a few branches but for visitors Toverhallern is convenient as it is a sight in itself. 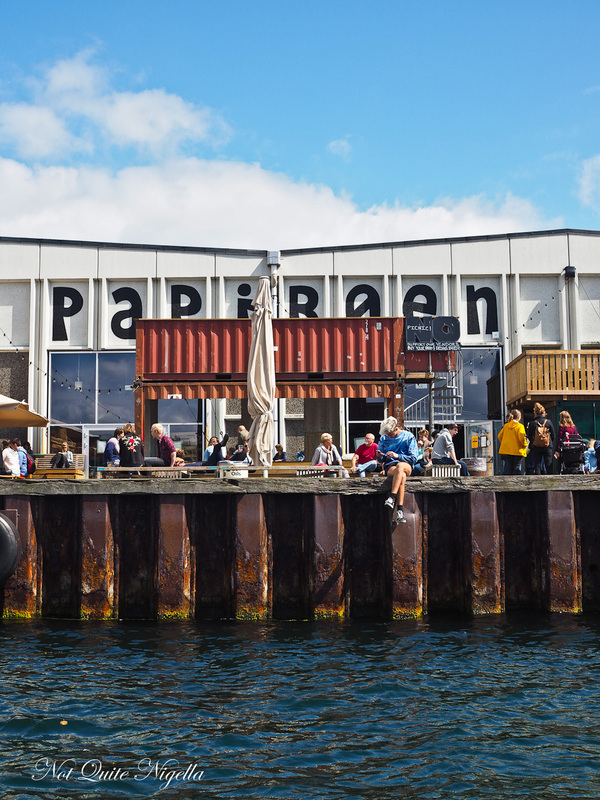 Copenhagen Street Food at Paper Island is the name of Copenhagen's main street food area. 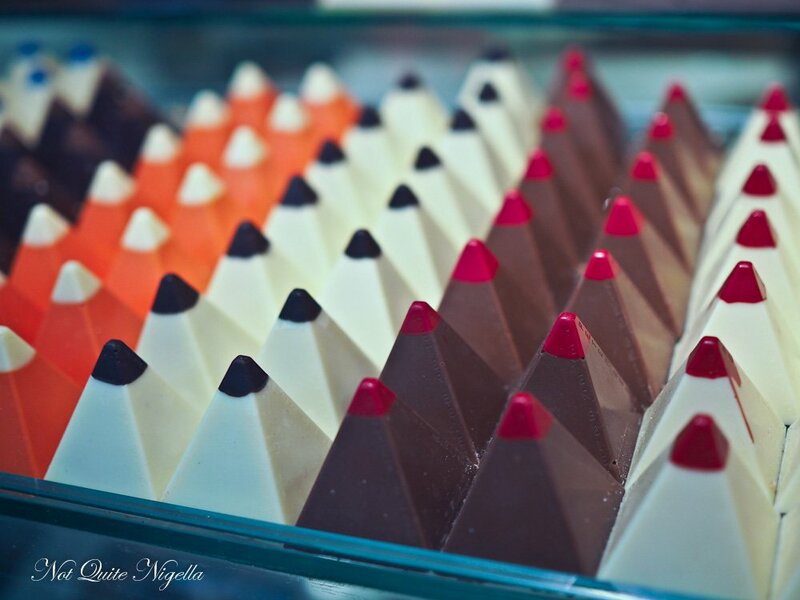 Started in April 2004 there are a range of stalls, each eclectically decked out with its own personality. It's a favourite place for Danes during the summer time and there is plenty of recycled and upcycled seating. Food from all nationalities is available and there are some fabulous hot dogs, sushi and fries. They're not inexpensive at around $15-$25 per dish but you can look for bargains. A stand there called Fish Art sells a burger that could easily feed two for 125KR or $25AUD. 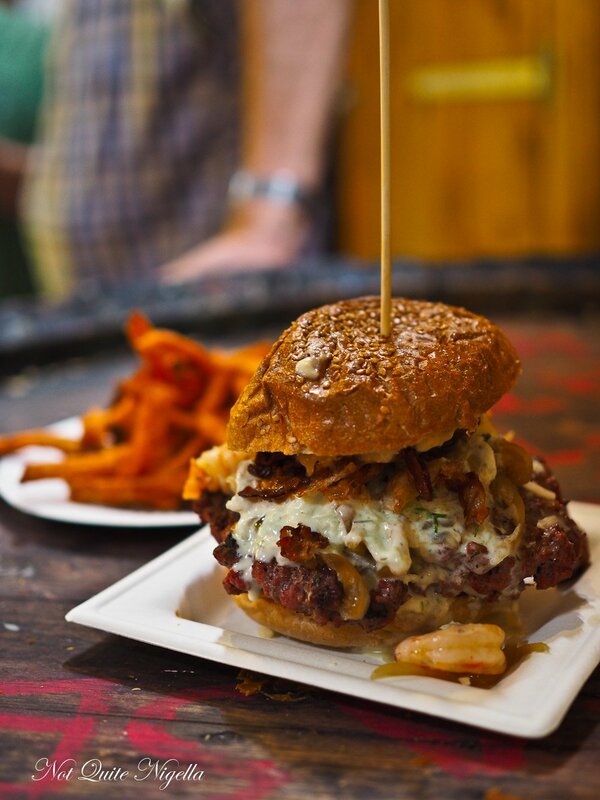 There's beef, cheese, whisky onions, prawns, scallops, bacon and triple cheese cream on a sourdough bun with a side of fries. Or Pølse Kompagniet has Street Food Super hot dogs (or regular). 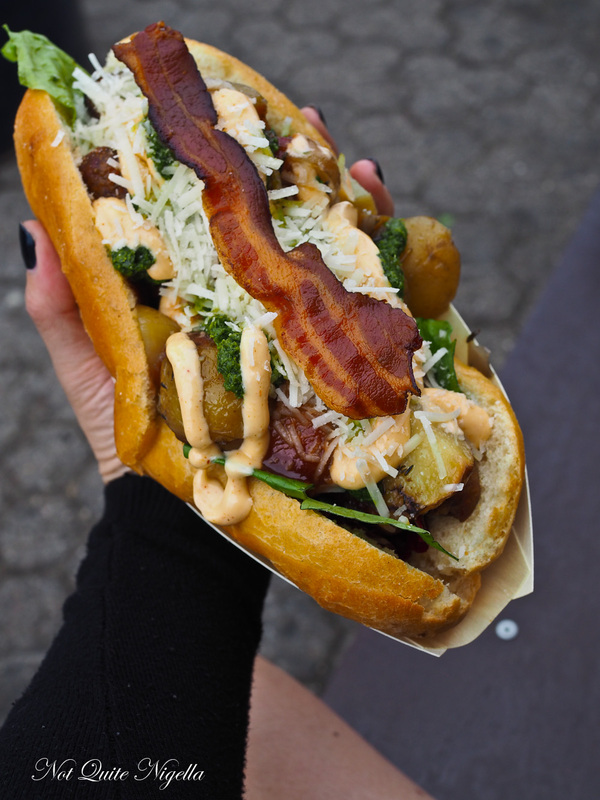 An super dog is 100KR ($20AUD) has two organic sausages, salad, roasted potatoes, carrots, onions, spicy mayo, parsley pesto and Caribbean Sauce. And for 25Kr more you can add on tiny new potatoes and a thin slice of crispy bacon. Unhinge jaw and enjoy. I know I know, so many countries have marshmallow puffs or snowballs and they are what they are, chocolate coated marshmallow. But at Peter Beier they're the couture version at a ready to wear price. Also called Danish cream puffs they're light as air and come in various different flavours. My favourite is the passionfruit followed by raspberry but there aren't any that you won't love. Mini sizes are 12KR each or $2.50AUD. And don't worry if you have missed out on visiting-he has a store at Copenhagen airport but you are best to eat them before you fly as the light as air marshmallow is prone to exploding with cabin pressure. 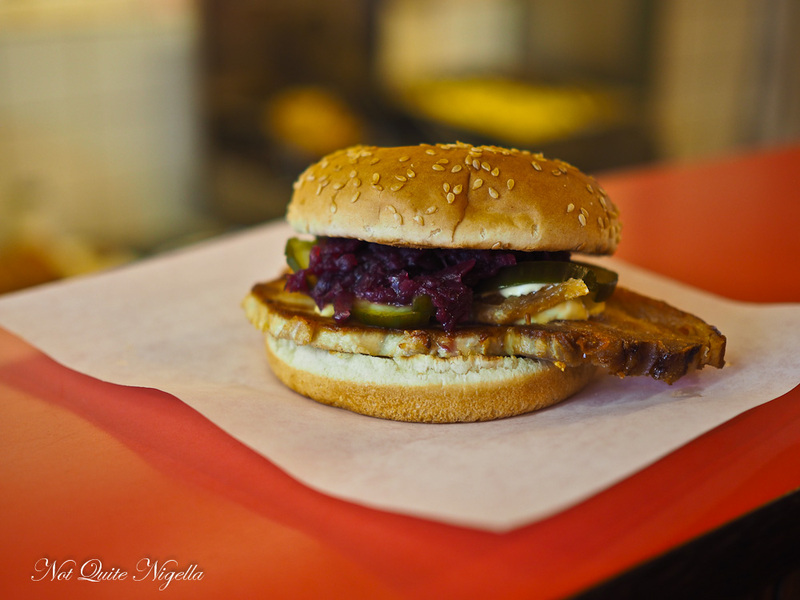 I couldn't visit Copenhagen without partaking of a pork sandwich. It is after all the national meat and Vesterbro, one of the hippest areas of Copenhagen is home to Isted Grill where Taiwanese born Mr Lee serves up what is said to be the best pork sandwich in Copenhagen. 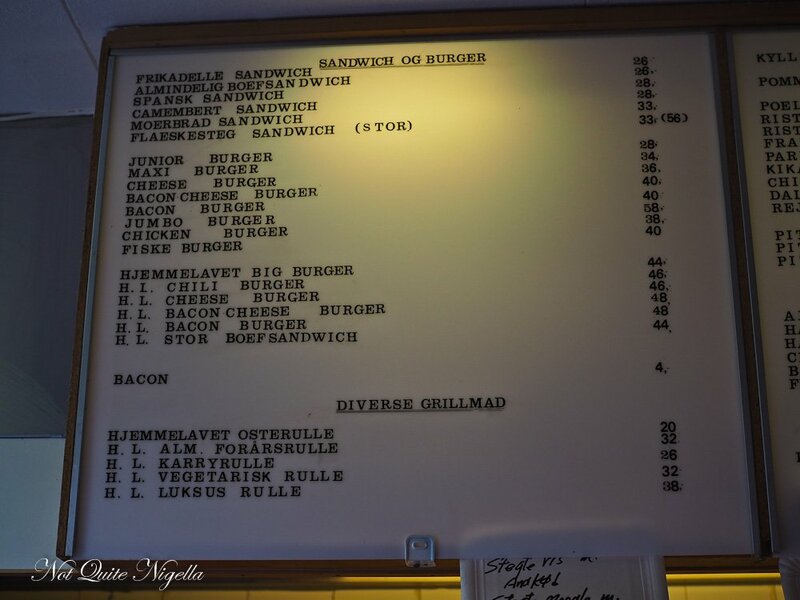 A bargain meal at 33KR or $6.50AUD it features a slice of roasted pork, heated on the grill to order and is placed on a sesame seed white hamburger bun with red cabbage, pickles and bernaise sauce (the latter if you ask for it, and do). It's filling and moreish and at first I don't think that there's quite enough pork but once you bite into it, it's juuust right. So you're looking for a nice dinner out but the very top range is out of reach? How about modern Nordic cuisine for less than $70AUD a head? Try Restaurant Host, on Nørre Farimagsgade along Ørstedsparken. Named after the Swedish word for Autumn it is a large restaurant divided up into many different multi layered sections. There is also a moody, dark basement but perhaps the most sought after section is in the "garden" where diners eat amongst leafy plants growing. Service is genuine and sincere and the crowd is mostly made up of groups going out on this Saturday night. 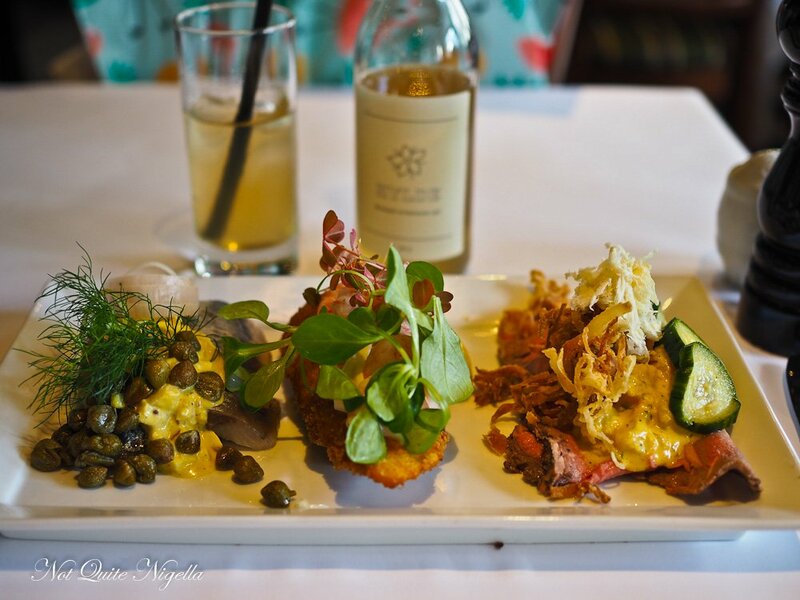 The best value is the Host menu which consists of three courses at 325KR/$65AUD. But what they don't tell you is that you end up with six courses by the end of it with substantial amuse bouches and inter courses. Value aside, the food is excellent with a beautiful amuse bouche of French breakfast radish with oyster and parsley cream, fresh peas and mussels and a petite egg flan with cod roe and a monk's cress. This segues into a puff cake with lovage and shrimp cream cheese and then the first official course arrives. The scallops come with white powdered maltose made of roasted chicken skin and blue mussels. 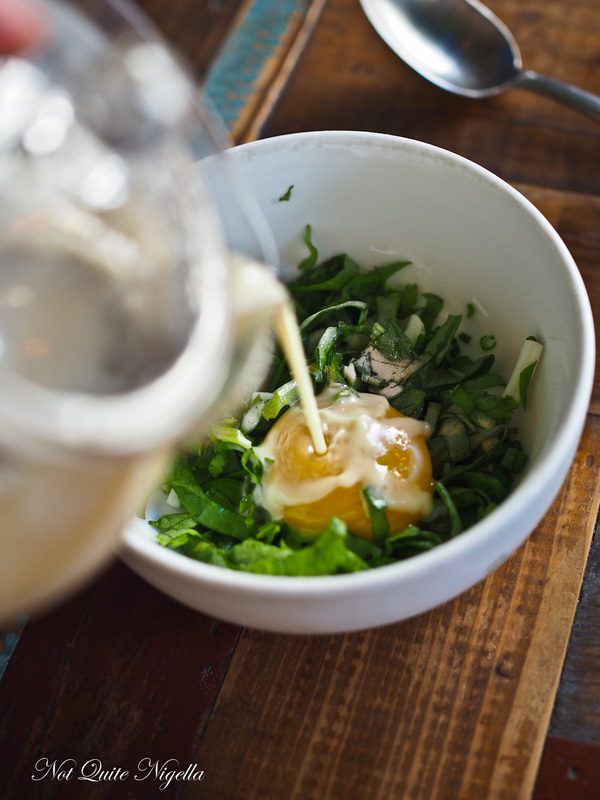 Then you are served another additional divine complimentary course of Danish squid with green beans chives and egg yolk over which a chicken soup with north-sea cheese is poured. The main is a pork shank with fennel, salted creme fracihe, wild herbs and grain vinaigrette with barley and quinoa which is rich and filling and this is served with Canadian Manitoba wheat roll with seaweed butter. Don't miss the pre dessert too-this serves the purpose of refreshing the palate but also exciting it and it is a sour milk yogurt mousse with a stout beer ice cream quennelle with a rye and raspberry crumble on top. And if you're lucky enough to visit in Summer you may end off with their strawberry dessert- a combination of two Danish summer desserts. 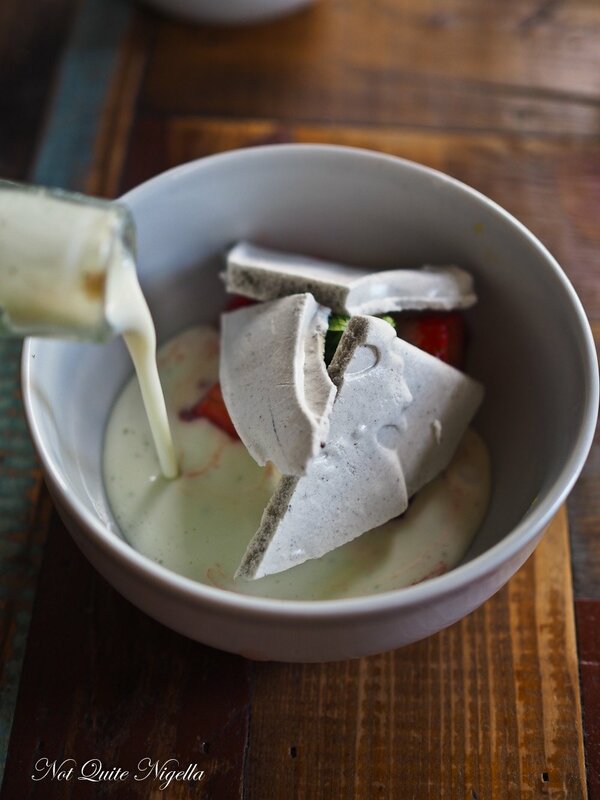 The first is strawberries and cream and the second is koldskål, a dessert made up of buttermilk. Instead of a biscuit it is topped with long pepper meringue and a lemon thyme sorbet. So tell me Dear Reader, when you travel do you go for a mix of cheap and high end eats? Or do you prefer one over another? Which item did you like the sound of best? 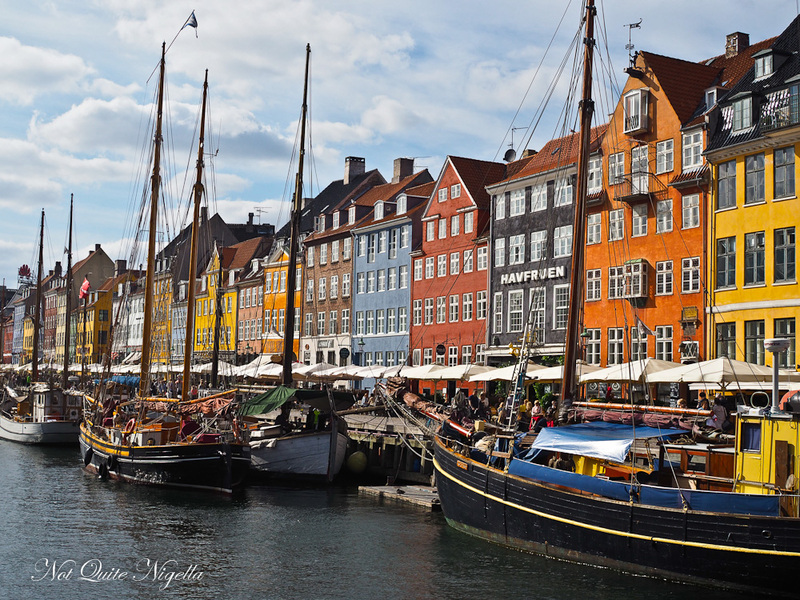 And have you ever been to Copenhagen and is there anything that you thought should be included? English is very widely spoken and Danes speak excellent English. A Copenhagen cards cover most of the key attractions with free metro, train and bus. Buying a SIM card is cheap and helpful with directions but I don't recommend buying a Lebara SIM. These sims have a known fault in which they stop working after a few hours. You need to ring them to get them to reboot the sim but they have restricted working hours and I was without internet access for 1.5 days because they were closed evenings and Sundays. Go for other providers. Plan Sundays carefully because many businesses are closed. It's best to try touristy areas like Nyhavn on a Sunday where the restaurants are open because some areas are very quiet on Sundays, particularly restaurants at night. Random interesting tidit: many Danes don't use weather apps on the phone, they check this site for weather which they say provides more accurate weather data. If you want to try a lot of these foods but don't have a lot of time, visit Torvehallerne. 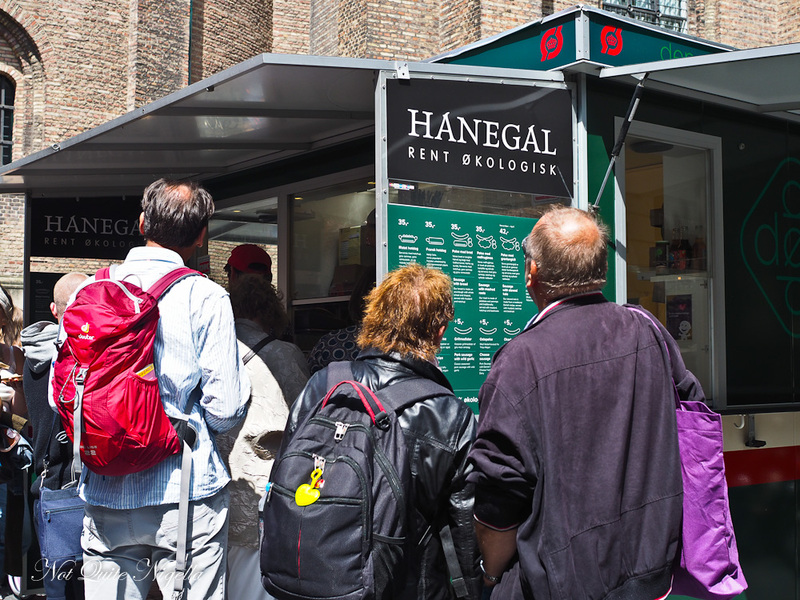 It is located at Israel Plads (Israels Square) near Norreport station and has been open since September 2011. There are around 100 stalls selling from from all over the world and it is divided up into two buildings and an outdoor area. One building features fresh meat, fish and pantry items while the other generally focuses on ready to eat food. 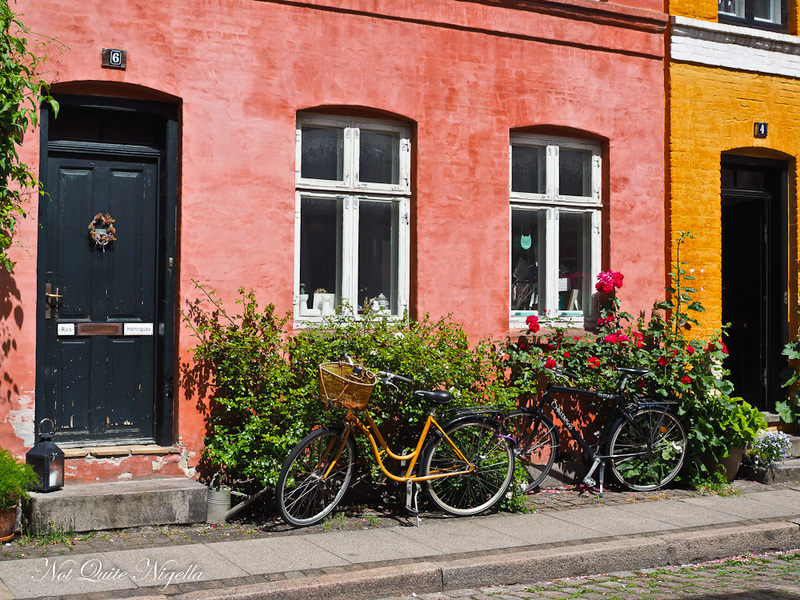 Free town or Christiania is a hippy area that is a popular tourist attraction. I heard so many different opinions on it so I had to visit for myself. It's well worth seeing although the area is currently tense with police raids as it is where hash is sold-illegally. So use commonsense and don't take photos of the area where they sell hash (it's clearly marked). And be prepared to miss out on it if there are police around. It is best visited during the day. Restaurant tipping is not mandatory or expected but 10% is appreciated. Water is always extra and paid for and can be priced per person (sometimes 25KR). Tax or "heraf moms" is 25% but is included in the menu price. 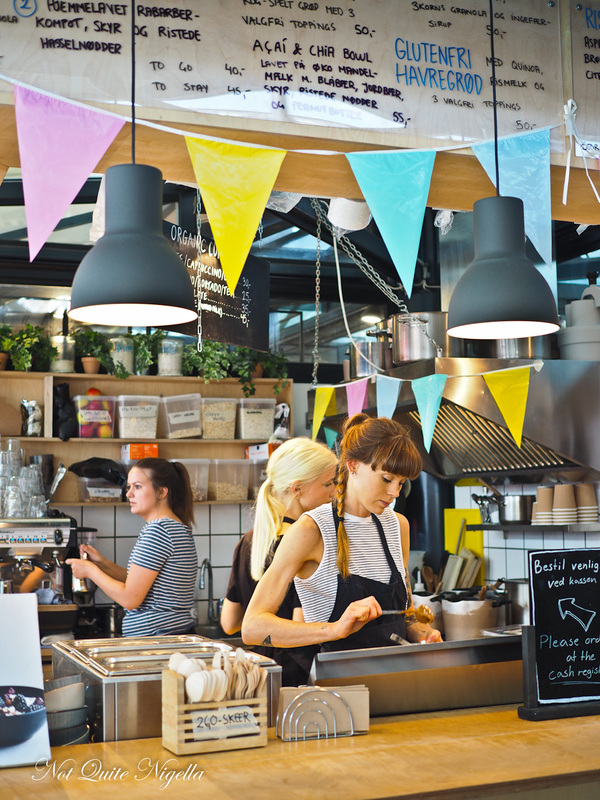 Most restaurants have a website and take bookings online in both Danish and English. There is a very cute chain store with cute designs called Tiger or Flying Tiger. 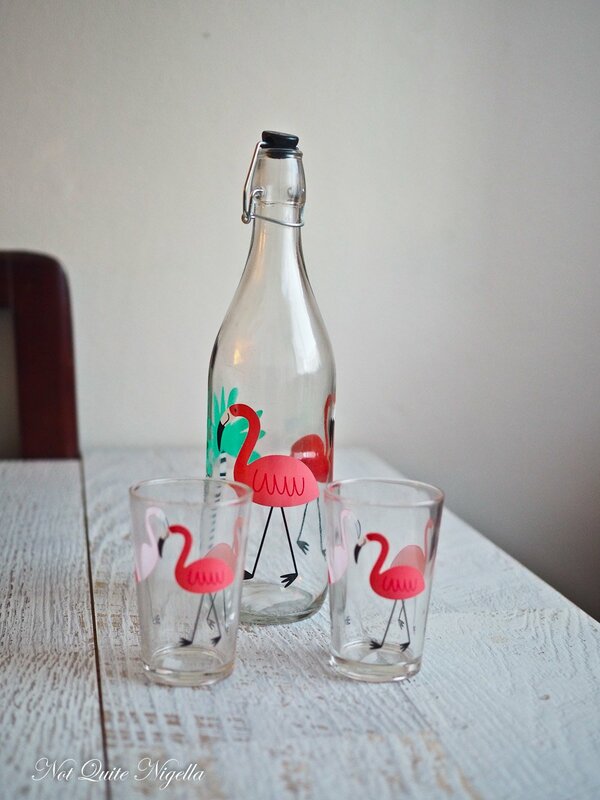 I didn't realise that it was a variety store when I walked in and ended up buying a few things from there including this flamingo set. The glasses were $1AUD each and the bottle $4AUD. Copenhagen Airport has a fantastic variety of shops and you could leave gift buying until here as the shops are all excellent quality. My favourite food shops were Johan Bulow for licorice (and I don't even like licorice, this will change your mind) and Peter Beier for the Flødeboller. 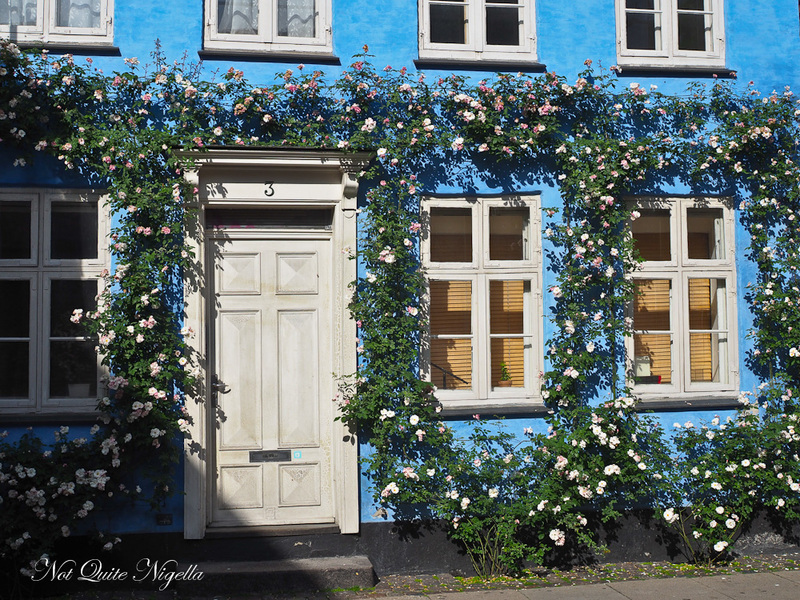 NQN visited Copenhagen as a guest of Wonderful Copenhagen & Singapore Airlines. All food except at Paper Island was independently paid for. 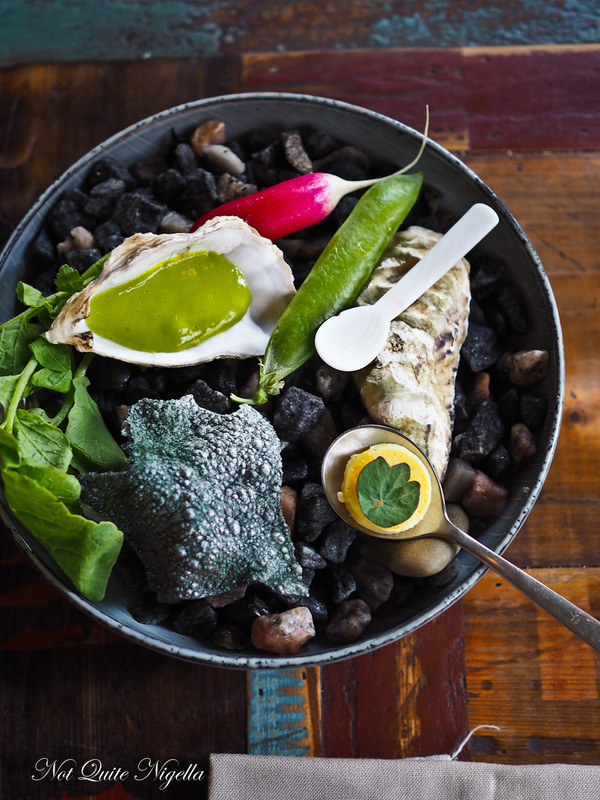 travelAnte & Bror: Noma's "Little Brothers"
travel Ante & Bror: Noma's "Little Brothers"